HOUSTON (CNS) — Reeling from the loss of a second child, Stephanie Regitz and husband Matt stopped to consider their family’s future. “Are we going to have any more children?” they wondered. The heartbreaking loss inspired Stephanie, at the encouragement of parish clergy, to start St. Gianna’s Hope Ministry to serve mothers and families who have suffered miscarriage or infant loss. According to some reports, one out of four pregnancies in the U.S. ends in a miscarriage, or the loss of a baby before the 20th week of pregnancy, and about one in 100 pregnancies is affected by stillbirth, the death of a baby before or during delivery. Since her child’s death nine years ago, she continues today her two-fold mission: to encourage and love mothers who have miscarried with care packages to respect “the dignity of the life of that child” and to coordinate a special annual Mass dedicated to mothers and families. Named after St. Gianna Beretta Molla, the St. Gianna’s Hope Memorial Mass for Infant Loss is held annually at Prince of Peace Catholic Church during the Christmas season in January. The Italian saint and physician, canonized by St. John Paul II in 2004, died a week after giving birth to her daughter. Despite complications, she had refused both an abortion and hysterectomy, knowing that to refuse could result in her own death. She died April 28, 1962. Today she is the patron of mothers, unborn children and physicians. Her feast day is April 28. “This time of year — Christmastime — particularly for those who have lost a baby, is very difficult. We are highlighting the birth of a baby,” she said, noting that even the pinnacle of the season, at Midnight Mass on Christmas, is the placing of the baby Jesus in the manger. Images, songs and manger scenes all portray the all-important birth of Christ. “It’s a uniting time of the year for us who have lost babies. Whereas for anyone that’s lost a child, the day that their child passes is a difficult day, but this time of year was difficult for everyone,” she told the Texas Catholic Herald, newspaper of the Archdiocese of Galveston-Houston. “At this Mass in the Christmas season we continue to celebrate those lives and recognize that we’re not alone in our grief,” she said. Stuffed animals — elephants, monkeys, teddy bears, one even sporting a Houston Astros Championship jersey — were also collected and donated to parish charities in honor of lost infants and children. 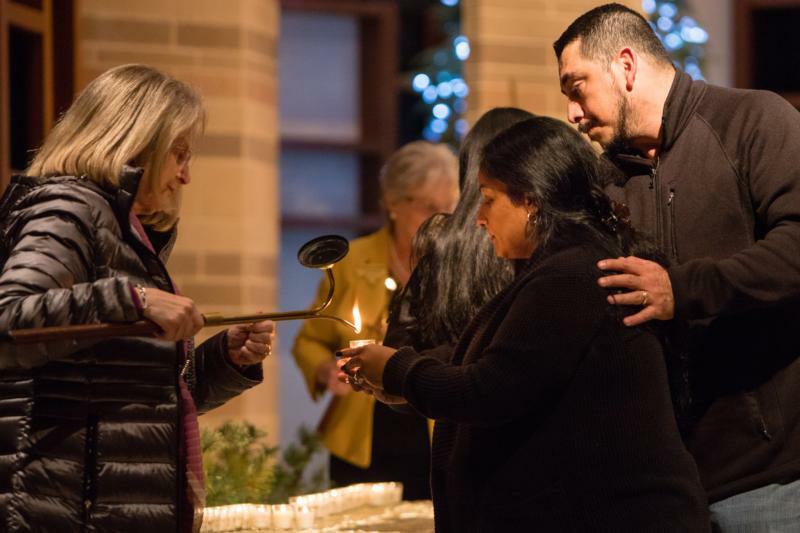 Hosted by a local court of the Catholic Daughters of the Americas, the ninth annual Mass featured a special candlelit service following the homily. Mothers and families came forward to light candles, each glowing light bearing the name of a lost child or infant, to place before an altar before a statue of Mary holding the Christ Child. Diverse families, mothers and fathers were visibly moved by the service, some wiping tears as they placed the candle and gazed at Mary. Many mothers and even grandmothers have never shared their miscarriages with anyone, Stephanie said, some coming to the Mass and admit their grief for the first time. Stephanie encouraged mothers and families who have lost children to unite with others in their grief, that it can bring hope, and to also serve others. The Mass breaks barriers of culture and language in the parish, organizers said. The annual Mass has inspired other parishes in the Archdiocese of Galveston-Houston to host their own memorial Masses. The Mass also has a special meaning for the men and fathers who have lost their children. And for Stephanie, this year’s Mass brought her family full circle: her 9-year-old son, Beckett, was an altar server at the very Mass that honored his three siblings — two boys and a girl — no longer with the family.